We have reserved rooms at four different university residences, at a special rate. You will have the chance to book a room in one of them when you fill in the registration form (available from March 23, until June 4, 2015). Important: the number of rooms reserved is limited! The sooner you register, the higher the chance to find a place at the residence of your choice. Once all the rooms we have reserved are booked, attendants will have to search accommodation by themselves. UPDATE (June 5, 2015): it is not possible to book accommodation anymore. Individual rooms (and a few double rooms) have been booked in the following three residences. The map below shows their location, with respect to the location of the venue. Below you will find a short description of each residence, and links to their official webpages. UPDATE: no more rooms are available at this residence. Accomodation. this is a residence for visiting professors, postdocs and graduate students. Rooms have: private bathroom, a kitchenette, air conditioning. Prices. Single room: € 54 / double room for single use: € 65 / double room € 81. VAT and breakfast included. Location. Within walking distance from the conference venue, it is located in the Campus Nord of UPC, a residential and very quiet area of Barcelona. There are few shops and restaurants in the neighborhood. 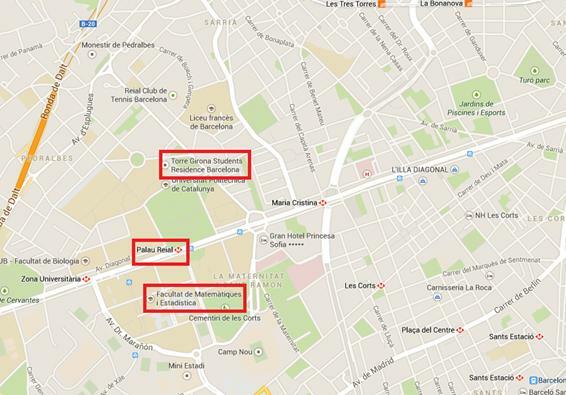 The closest metro station is Palau Reial (line 3, 750m away). The city center is about 25 minutes away by metro. From the airport to the residence. Take the train to Sants Estació, and there change to the metro, line 3, direction Zona Universitària. Get off at Palau Reial. Warning: the trains from the airport leave from Terminal 2. If you arrive in Terminal 1, you will have to first take a (free) shuttle bus to reach Terminal 2. From the residence to the venue. By foot, in 12 minutes (1.1 km). More information on the official webpage of the residence. Accomodation. This is a residence for visiting professors and researchers. Rooms have: private bathroom and air conditioning, but do not have kitchenette. Prices. Single room: € 64,50 / double room for single use: € 80 / double room € 92. VAT and breakfast included. Location. Right in the city center, very close to the gothic quarter and most of the touristic sights. It is located in the Raval, a multicultural neighborhood that is busy all day and night. The closest underground station is Liceu (line 3, 350m away). From the airport to the residence. The easiest way is to take the Aerobus (leaving from both terminals) and get off at the last stop, Plaça Catalunya. From there, walk down along Rambles until you find the Hospital street to your right. The total walk should take about 10 minutes. From the residence to the venue. Take the metro at Liceu, direction Zona Universitària, to Palau Reial. 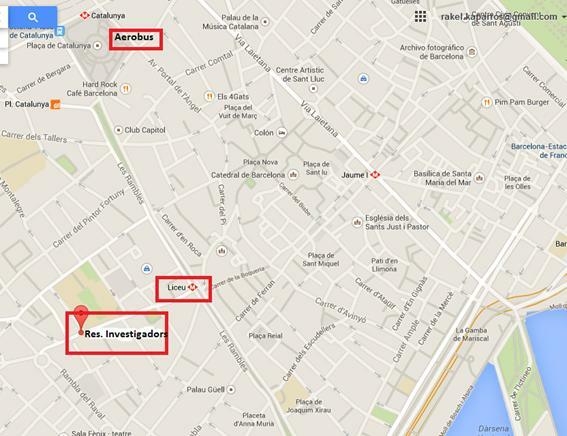 The venue is 5 minutes away by foot from Palau Reial. The total travel time should be around 25 minutes. Accomodation. This is a residence for both visiting professors and researchers, as well as for graduate and undergraduate students. Rooms have: private bathroom, a kitchenette, air conditioning, but only a very basic breakfast is provided (the residence has no cafeteria). Prices. Single room: € 68 / double room for single use: € 88 / double room € 98. VAT and basic breakfast basket included. Location. By the beach, and not far from the city center, in the traditional Barceloneta neighborhood. The area is well provided with bars and restaurants. The closest underground station is Barceloneta (line 4, 600m away). From the airport to the residence. You can take the train to Barcelona Sants, and there change to a train to Estació de França. From Estació de França it is 10-minute walk. Warning: the trains from the airport leave from Terminal 2. If you arrive in Terminal 1, you will have to first take a (free) shuttle bus to reach Terminal 2. From the residence to the venue. Take bus number 59 or D20 at Passeig Marítim, get off at Drassanes (bus stop “Portal de la Pau”). Alternatively, you can go on foot from the residence until Drassanes, it is a nice 20-minute walk. In Drassanes, take the metro direction Zona Universitària, until station Palau Reial. 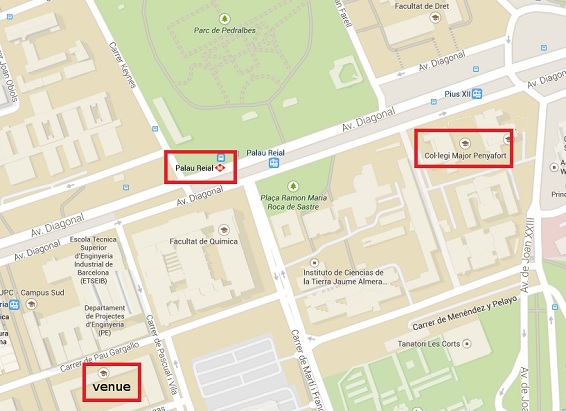 The venue is 5 minutes away by foot from Palau Reial. The total travel time should be around 45 minutes. Accomodation. This residence is intended mainly for undergraduate students. Rooms have private bathroom, but no air conditioning nor kitchen. Prices. Single room: € 21 / double room € 42. VAT included. Continental breakfast available for € 4.52 extra per person. Location. Student residence owned by Universitat de Barcelona that in the summer becomes the Barcelona Riders Palace Hostel. Located a few minutes away by foot from the conference venue, in the main avenue Diagonal. There are few shops and restaurants in the neighborhood. Metro station Palau Reial (line 3) is only 250m away. The city center is about 25 minutes away by metro. From the residence to the venue. By foot, in 8 minutes (700m).